On 29th June we held our yearly planning day at St Alban’s Church. This is our opportunity to get everyone involved with Darnall Dementia Group together to discuss current issues relevant to the group and gives people the chance to give their opinion about them. This year we discussed the imminent changes to our funding arrangements with the introduction of personal budgets, and the proposed co-operation with Age UK (formerly Age Concern) to help manage the changes. The day was very well attended with around 50 attenders, carers, volunteers, Management Committee members, paid staff and friends. We spent the morning looking at what was unique about the group, and how we could keep this uniqueness through the changes. 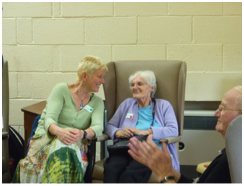 Lots of participants felt that people were treated like individuals at Darnall Dementia Group, and that members of the group went out of their way to make people feel welcome and valued – not just the attenders but everyone associated with DDG. The Group was valued by all, and there was a consensus that it should keep going. Key to maintaining the uniqueness appeared to be keeping staff and volunteer levels up, providing reliable transport and remaining small. Some felt that being part of a larger organisation could help us weather the changes. After the hard work of the morning, we had a lovely buffet lunch and following that a concert by Eric Brodie, assisted by Pam. Eric sang lots of old songs for us, accompanied by members of the audience singing along. Many even managed a dance. This was a lovely end to an uplifting day.